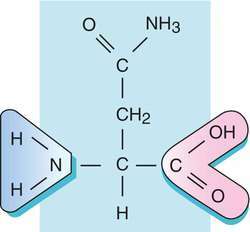 the β-amide of aspartic acid, a nonessential amino acid that is also used as a culture medium for certain bacteria. The β-amide of aspartic acid, the l-isomer is a nutritionally nonessential amino acid occurring in proteins; a diuretic. /as·par·a·gine/ (as-par´ah-jēn) (as-par´ah-jin) the β-amide of aspartic acid, a nonessential amino acid occurring in proteins; used in bacterial culture media. Symbols Asn and N.
A nonessential amino acid, C4H8N2O3, that is present in large amounts in some plants, such as asparagus. a nonessential amino acid found in many food and body proteins. It is easily hydrolyzed to aspartic acid and has diuretic properties. See also amino acid, protein. Fig. 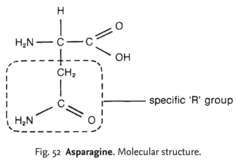 52 Asparagine . Molecular structure. one of 20 AMINO ACIDS common in proteins. It has a polar ‘R’ structure and is water soluble. The ISOELECTRIC POINT of asparagine is 5.4.
n a nonessential amino acid found in many proteins in the body. Asn; the β-amide of aspartic acid, a nonessential amino acid occurring in proteins. If the findings are confirmed in human cells, limiting the amount of asparagine cancer patients ingest could be a potential strategy to augment existing therapies and to prevent the spread of breast cancer, Knott added. drinks that are nutritionally balanced, but lack asparagine. Considering that asparagine is the limiting factor for the formation of acrylamide in plantain chips, its content which depends on several factors such as production parameters and maturity stage should be explored. A pink zone was observed around the colonies suggesting that endophytic fungi were able to utilize the substrate asparagine by secreting the enzyme asparaginase which catalyzes the breakdown of the substrate (Figure 3). This was carried out following the method for asparaginase assay except changing the substrate of the reaction from asparagines to glutamine. Cytochrome C from equine and bovine heart, normal and sickle cell hemoglobin, sinapinic acid, acetic anhydride, amino acids (serine, cysteine, tyrosine, threonine, asparagine, glutamine, lysine, arginine, histidine, and glycine), urea, pepsin, and n-butylamine were purchased from Sigma (St. Similarly specific point mutations in the DHFR gene are also known to be associated with pyremethamine resistance: alanine to valine at 16, asparagine to isoleucine at 51, cysteine to asparagine at 59, serine to asparagine or threonine at 108 and isoleucine to leucine at 164. Acrylamide also is formed as an intermediate in the Maillard reaction between the amino acid asparagine and reducing sugars. Induction of microspore embryogenesis in cultured anthers of Hordeum vulgare: the effects of ammonium nitrate, glutamine and asparagine as nitrogen sources. Mutation analysis of the LMNA gene in this patient demonstrated a base pair change that results in an aspartic acid to asparagine amino acid change at residue 596. The polynucleotide includes a polynucleotide which has a nucleotide sequence encoding an amino acid sequence from methionine at position 1 to asparagine at position 243 of SEQ ID NO: 2 in the sequence listing, or which has a nucleotide sequence encoding the amino acid sequence having one or several amino acid deletions, substitutions and/or additions and is capable of controlling salt stress tolerance.